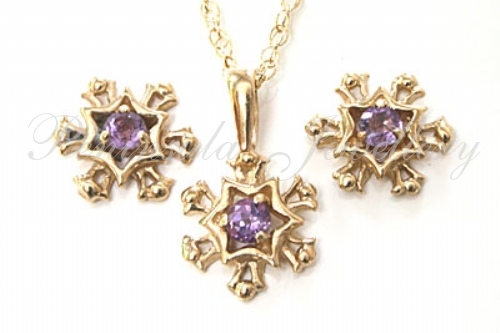 Pendant: Featuring a 2.75mm Amethyst gemstone which has been claw set in the centre. Solid 9ct gold fittings. Dimensions: 14mm x 9mm including fixed bail. Comes complete with an 18" gold Prince of Wales chain. Earrings: Featuring 2.5mm Amethyst gemstones which have been claw set in the centre. Solid 9ct gold fittings. Dimensions: 9mm diameter. Made in England. Supplied in a luxury gift box.